The design team must focus the planning process on understanding and interpreting each of these elements. the concept for development results from the integration of the requirements of site, community and program. 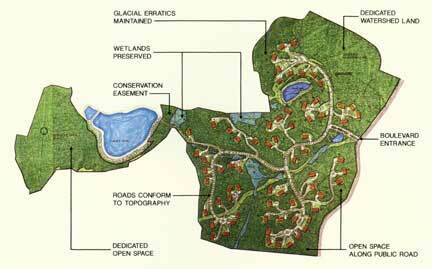 Our land planning experience includes traditional residential subdivisions, cluster and planned unit developments, golf course communities, multifamily housing, office and industrial parks, corporate headquarters, shopping centers and institutional uses. Clients include landowners, corporations and development firms. Work often begins at the initial site acquisition and analysis stage, and normally continues throughout the entire development review and approval process. Over the years, the result has been the construction of well-planned developments providing housing, shopping, employment and educational opportunities for thousands of families, in addition to the preservation of thousands of acres of permanent open space for environmental and recreational purposes.